Olives South Australia Inc (OSA) is the peak industry body representing olive growers in South Australia since 1996. OSA is a “participating state body” of the Australian Olive Association (AOA). In 2007 the National olive industry underwent a structural reorganisation which has seen all other states become branches of the national body (AOA). Whilst Olives SA acts like a branch and is bound to the AOA by way of a “memorandum of understanding”, we retain our constitution. Our vision is to ensure that OSA leads a profitable, sustainable and united olive industry for South Australia. The Board of Olives SA is made up of growers (majority); processors, harvesting contractors and other invited representatives from Primary Industries SA, Rural Solutions SA and the Adelaide University. 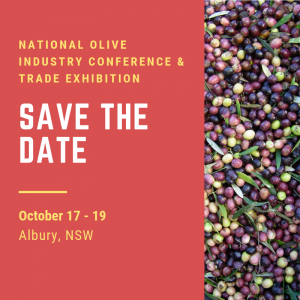 Interact with the South Australian Government on behalf of the olive industry in South Australia. Identify and recommend Research & Development projects to the Australian Olive Association (AOA) Research & Development Committee. Support the aims and objectives of the AOA in South Australia. Be involved in the development of policy that impacts on growers at a State and regional level. Support quality systems and processes. Communicate and disseminate information to the various regions via elected regional representatives, email and Association Newsletter “The Olive Tree Newsletter”. Administer activities such as workshops, field days and seminars to educate growers and consumers. OCCUPATIONAL HEALTH & SAFETY: Growers and Processors should be aware of their legal responsibilities regarding Occupational Health and Safety in relation to safe work practice and a safe work environment. It is strongly recommended that independent advice be obtained.